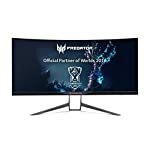 The Samsung S34E790C is a beautiful looking ultra wide screen monitor for those of us with a lot of desk space! 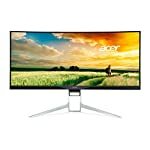 The 34″ ultra wide format is an increasingly popular spec with Samsung competing closely with other manufacturers such as LG to provide the best offering. Gamers enjoy the increased immersion and you also get a lot of lovely desktop space for your applications too, it’s easy to see the attraction. The jury is still out as to whether the curved effect is a a real win or just a gimmick but personally I think it does look super cool. The curve helps to bring the outer reaches of the screen into your view without distorting the image in front of you – that’s the theory at least! The S34E790C is an imposing monitor and one that will impress anyone passing by your desk. The stand is solid, it needs to be to support a screen of this size, you can adjust both the vertical tilt and height but there is no horizontal pivoting on this one. But that aside the quality of manufacturing is excellent. The monitor takes up a lot of your desk space but it stands solid, you won’t get vibrations as you pound away on the keyboard and mouse. The Samsung monitor comes with HDMI and DisplayPort connectivity, there are also USB 3.0 included along with built in speakers and a headphone socket. The monitor is also one of the more power efficient models requiring around 39W to keep it running according to testers. Getting the best colour setup on the S34E790C will require some calibration, but there are various sources to help with that once you make the decision to purchase, I don’t claim to be an expert when it comes to such things. The professional reviews seem to think that Samsung should have been able to get more out of the VA screen, a better contrast and deeper blacks for example. But the monitor will be fine for casual users. The curve screen has no impact on the image quality, good or bad. Whether there is any real value to it is probably down to personal choice. Some will feel it adds little to the experience whereas others love how it brings the edges closer to your peripheral vision. For gaming you’ll need to switch the overdrive function on, and even then the response time is a little off the pace. It’s OK for gaming but it clearly hasn’t been designed with fast moving shooter users in mind, it doesn’t have the modern game orientated features built into the design. On the plus side the input lag comes out well so at least it will feel responsive, not like you are lagging behind the action as it appears in front of you. It’s good for a VA monitor in this respect. Overall Samsung could have done better with the default setup and the contrast is lower than expected for a VA screen, but it still beats a typical IPS panel especially when it comes to deep blacks. But the 34″ QHD resolution monitor is great for working on, providing plenty of space for your applications. You’ll get an OK gaming experience but this screen is not built around the needs of a gamer so bear that in mind if fast action games are your priority. Slower paced strategy games will look stunning. We give the Samsung S34E790C a 4 out of 5 rating. Want to know what existing owners of the monitor think? You can read real user reviews here. 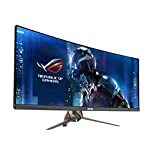 Should I buy the Samsung S34E790C?